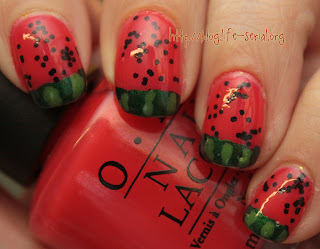 The one with Fail Art Thursday - watermelons! I started with two coats of OPI Guy Meets Gal-veston, then one coat of WnW Tangled in my Web, then one more coat of OPI Guy Meets Gal-veston. 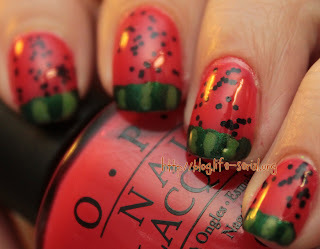 For the tips, I freehanded Zoya Holly across the whole tip, then used Zoya Midori to make some squiggly stripes across the tips. I think they turned out pretty well! I wore them for two days because I liked them so much :) Have you guys every tried watermelon nails? Or any other kind of fruit?